during the NatWest T20 Final match between Birmingham Bears and Notts Outlaws at Edgbaston, Birmingham, United Kingdom on 2 September 2017. Photo by Simon Trafford. Reigning T20 champions, the Notts Outlaws, have begun their Vitality Blast title defence – and you can be there to cheer them on in their next home game. In conjunction with the Green and Golds, five family tickets (worth £50 each) for the match against Durham Jets at Trent Bridge next Tuesday (Tuesday 17 July) are up for grabs. The Outlaws are once again captained by Australian Dan Christian, who led the side to glory at Finals Day last September. 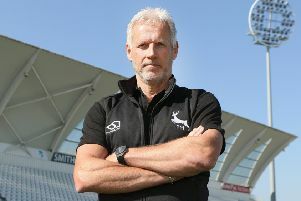 He will be joined by fellow overseas player Ish Sodhi – ranked the number one T20 bowler in this world earlier this year – as well as big hitters Riki Wessels, Tom Moores, Samit Patel and Steven Mullaney and experienced death bowlers Luke Fletcher and Harry Gurney. There are six opportunities to enjoy the explosive action at Trent Bridge right through to 10 AugustMatches include: Durham Jets – Tuesday 17 July, 6.30pm; Leicestershire Foxes – Friday 20 July, 6.30pm; Lancashire – Friday 27 July 6.30pm; Derbyshire Falcons – Thursday 2 August, 6.30pm; Worcestershire – Saturday 4 August, 7pm; Yorkshire – Friday 10 August. Who will be captain of the Outlaws for this year’s Vitality Blast? Please note that by entering, you agree for Nottinghamshire CCC to contact you about latest news and ticket offers. (they won’t ever pass your details to third parties). Winners can collect their tickets on the day of the game from the Trent Bridge ticket office. Our usual competition rules apply. If you’re not lucky enough to win tickets, you can save money by purchasing tickets in advance – visit trentbridge.co.uk/twenty20 or call on 0115 899 0300.